A Kalorama classic and an American gem in Charlottesville. 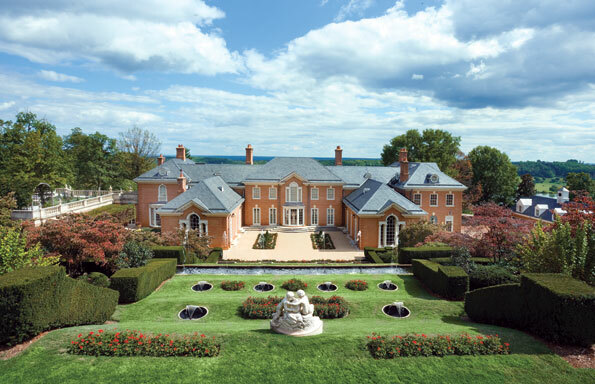 Albermarle House’s neighbors include some of Virginia’s most important estates, including Thomas Jefferson’s Monticello and James Monroe’s Ash Lawn Highland. Built in the neo-Georgian style, the residence is a stunning example of an English country estate sitting on over 300 acres. Conceived by philanthropist and wine maker Patricia Kluge and world-renowned architect and designer David Easton, it was built by accomplished artisans and craftsmen whose vision became the inspiration for the next generation of manor-style houses. The offering includes the 45-room main house, a pool house and pavilion, a log cabin, several staff cottages and garages, a thatched roof greenhouse, and a tournament-level croquet lawn.